Conventional Tubing Conveyed Perforating (TCP) resulted in high near well bore friction pressures causing premature screen out of the hydraulic fracture treatment. By abrasive perforating the formation, near well bore friction pressures were significantly lower. 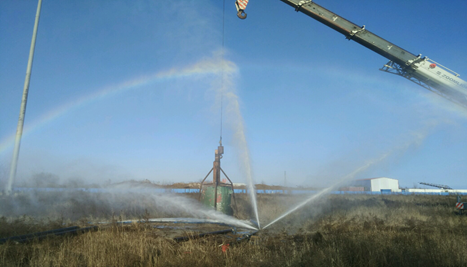 The hydraulic fracture treatments were placed at lower pressures without further problems.Using Abrasive Perforating also has certain safety advantages over conventional perforating. There are no explosives to handle, or the risks associated with running TCP guns into a well bore. Our abrasive perforation system is not only a viable alternative to TCP or conventional wireline perforating, but it can also perforate wells where other systems are not an option. The system has proven successful in perforating drill collars, drill pipe and multiple casing strings in a single trip.